What benefits have buyers mentioned in their reviews for this Carrera Sulcata? This mountain bicycle is clearly designed to stand out – through both its looks and the ability to perform tricks – and there are positive comments about both aspects in user reviews. Many see this a strong, responsive bike that its able to handle challenges with ease. Some use this a worthy aid for tough mountain biking on steep, slippery hills, although they also say that it has proven to be capable on the road too. Others are impressed with the performance of the brakes and the lightweight. The Carrera bike has an alloy frame, SRAM gears to make short work of inclines and Tektro Novela mechanical disc brakes. The tyres are often one of the first components to be upgraded on a new bike, because many manufacturers simply add the cheapest option to cut corners, but this is not the case with the Sulcata. Users are impressed with the way that the tyres handle rough terrain and help to keep riders steady on the trails. This product uses what it call “beefy” 29″x 2.2″ front and 29″x 2.0″ rear Kenda K-1080 tyres and when this is paired with the Suntour forks and the surprisingly well padded saddle, most buyers seem to be in for a comfortable, reliable ride. Are there any drawbacks to this Carrera Sulcata Mountain Bike that buyers need to be aware of? Unfortunately, there are some downsides to the specification and design that mean that some buyers are are little critical of the bike’s potential as a long-term option. A few have mentioned the lack of a chain ring guard. When the chain slips, it can really affect the performance and has also scratched the paintwork. There are also comments about the gear shifters, with some saying that they are difficult to adjust and make odd noises. Some assume that this is an assembly error, however, and others say that they quickly got the hang of how to use them. Summary: does this all mean that the Carrera Sulcata 29er is recommendable? There are some elements of this mtb could be improved in order to keep more buyers happy – the most obvious being the issue with the chain – but a lot of the problems seem to either be personal preference issues, or issues that quickly work themselves out with some practice or fine tuning. Essentially, the Carrera bike seems to cover all the bases. Riders that are keen to rack up the miles and explore the trails can appreciate the gears and the quality of the tyres while those that are more into the tricks and manoeuvres can appreciate the style, suspension and braking. 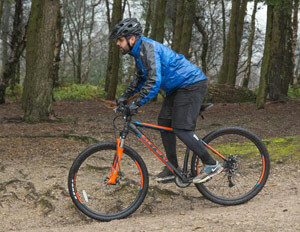 Find more reviews about the Carrera Sulcata Mountain Bike on Halfords here. I personally love my sulcata but dislike the ‘over-branding’ of the carrera brand. So I repainted mine matte yellow and can personally say it looks like a £500 bike. Along withh this I have upgraded the disc brakes to hydraulic, replaced my front fork and also changed my handlebars aand pedals, it literally is a new bike! 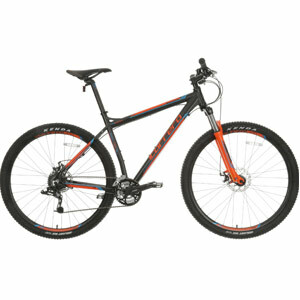 I love my Carrera and take it to local bike trails and it performs much better than my previous bike’s – (Giant and Trek). If you buy this I would suggest all of the above upgrades as they do make the difference… Happy Trails! – andy.